"The best spanish jamon I've ever tasted." Andreu charcutería y degustacion is a space where you can enjoy a selection of products with a certified origin that faithfully respect the most traditional production methods to create a unique taste. In the shop area you will find everything you could need to organise a quick and practical meal, for day-to-day life or for a special event. 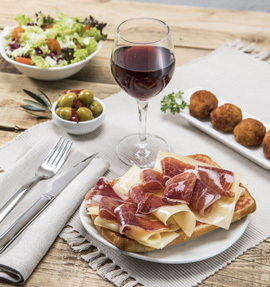 Our Bellota Iberian ham is our pride and glory, and it is complemented by our selection of deli meats, pâtés and foie gras, our sensational smoked salmon and our extensive range of cheeses, among other artisan and natural products. 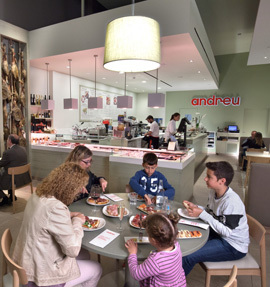 In our tasting area you will find the ideal setting to have a meal at any time of the day - we have a complete menu with over 80 products that we have selected just for you. 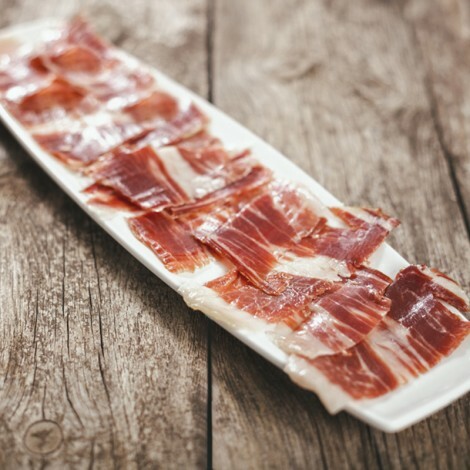 Our Bellota hams are the result of a long artisan and traditional production process. The breeding of selected Iberian Pigs and the curing of each individual piece under the best conditions, in addition to the professional selection criteria, guarantee the quality of the product, making it a unique and unparalleled dish, with a perfect taste, aroma, texture and colour. At Andreu we know where the difference lies.